I'd known about Adrian Tomine for awhile before reading any of his work — sometimes it's just like that. You hear about someone, but you only have so much time and money, and certain cartoonists grab your attention before others. But eventually I picked up his graphic novel Shortcomings, some issues of his comic book Optic Nerve, and his comedy Scenes from an Impending Marriage. And recently I got several collections of his short pieces and devoured them (one arrived in the mail and I read it that same afternoon). Tomine's draftsmanship has grown over the years from serviceable to beautiful. His brushstroke and pen linework are now flawless. And his visual storytelling has gotten more subtle. But I think his biggest strength is as a writer. Almost all of his comics work is in the short story format, and he really excels at that. His characters and the situations he puts them in feel more akin to Raymond Carver or the like than to monthly comic books from the genre publishers. He's dark, clever, honest, and sometimes brutal — but never in a way that's unearned. Even the best comics don't often get me misty-eyed, but some of Tomine's stories have affected me emotionally in as strong a way as the best of Jaime Hernandez. One of comics' strengths is that there's so much good material out there that it's impossible to keep up with all the good stuff. But I'm glad to've finally read the bulk of Tomine's work to date, and I'm excited for more. If you're interested in a starting point, I'd recommend beginning with the Summer Blonde collection — but you also can't go wrong with Sleepwalk and Other Stories, Shortcomings, Scenes from an Impending Marriage, or Killing and Dying. 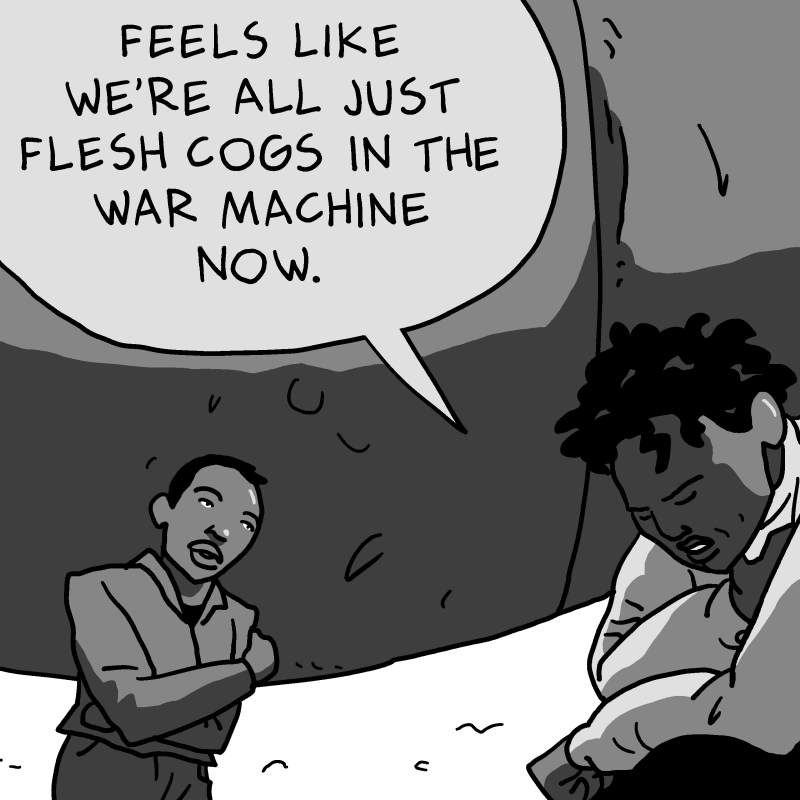 I've posted new pages of my own comic, Flesh Machine, over at michaelavolio.com! We've started a new act of the story... New readers should start from the beginning.